The protesters - who are demanding greater media freedom and free elections - shouted "Resign!" But Mr Vucic refused to bow to the pressure, saying: "I am not afraid." Many in the crowd blew whistles and shouted "He is finished!" Milosevic was president of Serbia and later Yugoslavia during the latter's violent break-up in the 1990s. His government placed severe curbs on independent media. Addressing the cheering crowds on Sunday, opposition activist Borko Stefanovic said: "We shall continue the blockade of the presidency and we will not leave until our demands are met or unless we get firm guarantees that our demands will be met." The protest was organised as President Vucic was giving a televised address from inside his residence on Saturday's violence. "Serbia is a democratic country, a country of law and order and Serbia will know how to respond," the president said, branding the protesters "fascists, hooligans and thieves". "They think they have the right, 1,000 of them, to determine the fate of the country," Mr Vucic added, probably underestimating the number of protesters involved. 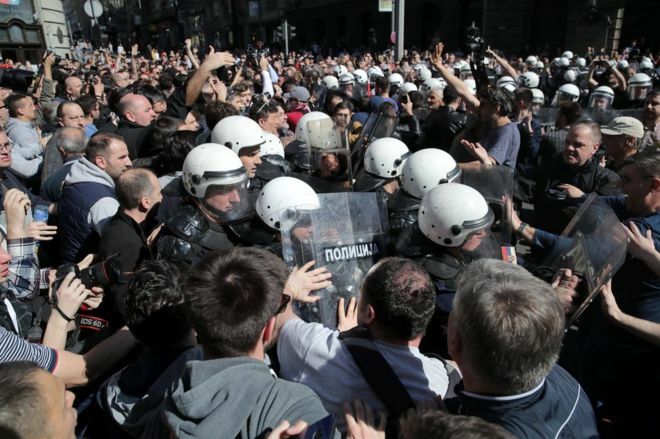 After the president's address, crowds of people marched from the residence to the city's main police station, demanding that the people who were arrested at the Radio Television of Serbia (RTS) building on Saturday night be released. In November last year, Mr Stefanovic - leader of the Serbian Left - was beaten up and left unconscious by a group of young men in dark clothing. He was among those who occupied the public broadcaster RTS's building on Saturday and, according to Balkan Insight, was physically dragged out of the building by police officers. "We aren't asking for much," Mr Obradovic demanded at the station. "An immediate broadcast with participation of a representative of the organisers of the protests, not of politicians." Mr Vucic has called Mr Obradovic "a fascist".